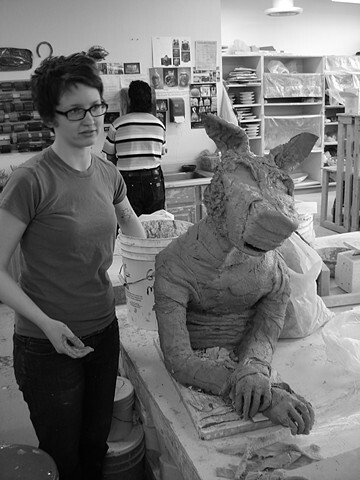 This course addresses issues in Ceramics that are not usually covered in Introductory-level classes. I encourage students to work beyond a bag of commercially mixed clay and an electric kiln  students explore clay and glaze formulation, especially the use of natural materials (wood ash, indigenous clay bodies, river silt for slips, etc.). Students learn to mix their own clay bodies, and utilize a variety of additives  paper clay, deflocculated clay bodies, wedging organic materials into clay to create texture after the firing, etc. Students also explore mold making, both for casting ceramics and non-ceramic materials (for example, in one assignment we create plaster molds for both clay and neoprene casting). This assignment involved dipping fabric or other absorbent materials into deflocculated casting slip (stoneware, or translucent porcelain) and draping the slip over a cardboard armature.